Our surname “Baker” comes from Old English “baecere”, meaning “baker”, and was an occupational name. Variations of this name include: Bakere, Baiker, Backer, and others. Our line of Bakers came from England. Our earliest known ancestor was Simon Baker who was born @1500 and lived in Kent, England.It is believed that they were originally Normans that came over with William the Conqueror in 1066. 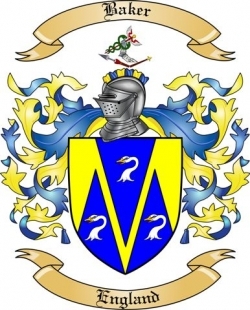 The earliest mention of this surname was of a William le Bakere in Norfolk in 1177. The first Baker in our line to come to the U.S. was Andrew Baker, who came from Buckinghamshire to Plymouth Colony in 1624. This is a reenactment of my grandparents’, Claude and Nettie (Burke) Baker, first meeting. 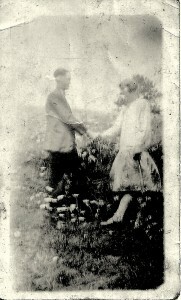 It was probably taken around the time of their marriage in the late 1920’s. 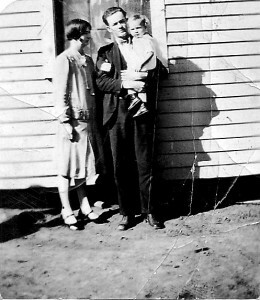 A young Claude & Nettie (Burke) Baker and their oldest son, Paul. 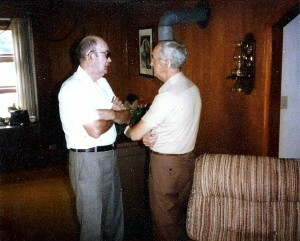 Claude & Oscar Baker. The young boy is one of Oscar’s sons. I don’t have his name at this time. 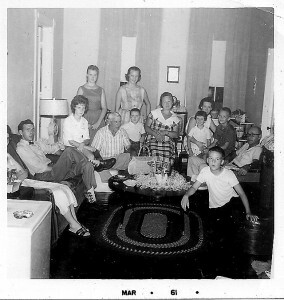 (Back, l-r) Dewey Burke, Shirley (Baker) Gay, Nettie (Burke) Baker, Joe Livesay, (Middle, l-r) Marvin Livesay, Majorie (Livesay) Singleton, James Baker, Paul Baker, Edna (Livesay) , (Front) Evelyn (Baker) Roberts. 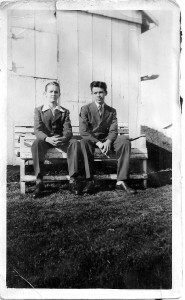 My uncles, James & Paul Baker, doing their best to look respectable. My uncle, James Baker. 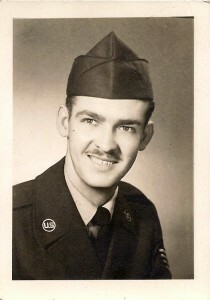 He was a Staff Sergeant in the U.S. Air Force during the Korean War. 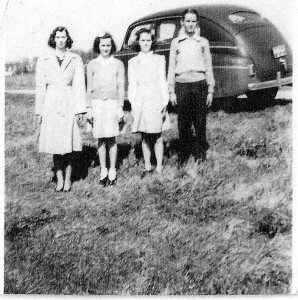 (l-r) Grandma Nettie (Burke) Baker, Evelyn (Baker) Roberts, Shirley (Baker) Gay, James Baker. The Bakers at our house in Kettering, Ohio, 1981. 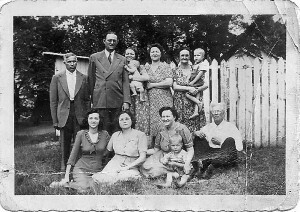 (l-r) Rhonda (Pittman) Baker, Jodie Baker, David Baker, Nettie (Burke) Baker, Evelyn (Baker) Roberts, Claude Baker, Gwen Roberts, Dan Gay, Shirley (Baker) Gay, Donna Gay. 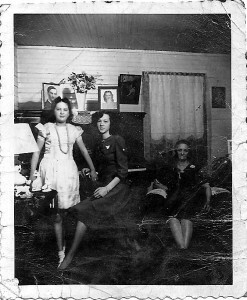 My great aunt, Sophie (Baker) Livesay. The Bakers in Ohio, March, 1961. 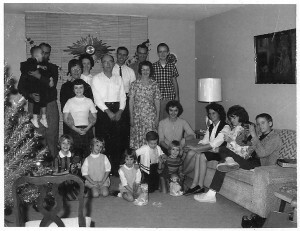 Christmas with the Baker family in Ohio, mid 1960’s. 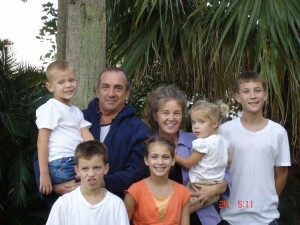 Al & Sharon (Baker) Holguin posing with their grandkids in 2005. Sharon is the daughter of Paul and Virginia Baker. 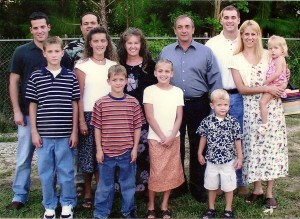 The Holguin clan 2004. (Back, l-r) Mike Holguin, Brent Lowe, John Holquin, (Middle, l-r) Andrew Lowe, Ann (Holguin) Lowe, Sharon (Baker) Holguin, Keri Holguin, Kelly Holguin, (Front, l-r) Aaron Lowe, Ashley Lowe, Johnny Holguin Jr.
Grandpa Baker at Mom’s house in Kettering, Ohio, not long before his death in 1992. We had the privilege of caring for him the last few years of his life. 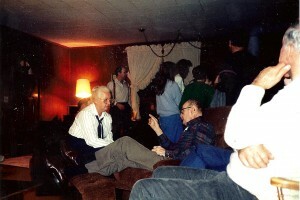 I loved to hear him tell jokes or old stories that we had heard a hundred times. He had a gift for telling funny stories. 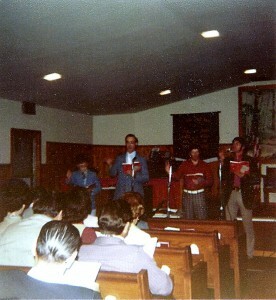 My uncle, James Baker, teaching singing school in Dayton, Ohio. He would travel through the country teaching people how to read shape note music and how to lead singing. I’m the brat on his right. Jeremy Kouba, rear, second from right. Jeremy is the son of Debra (Baker) Conner and the grandson of James & Monnie Baker. This picture was taken directly after the US invaded Afghanistan following 9/11. 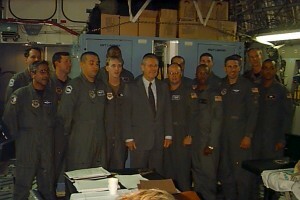 Jeremy and his fellow airmen are posing with then Secretary of Defense, Donald Rumsfeld. Grandpa & Grandma Baker at their 50th wedding anniversary celebration. 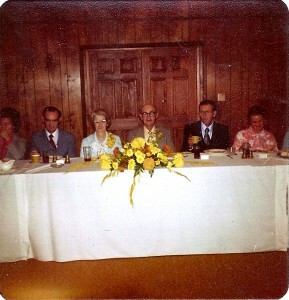 My grandparents’ 50th wedding anniversary. 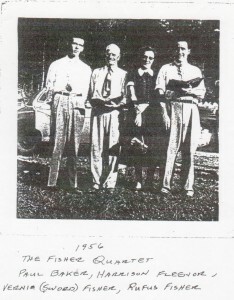 (l-r) Monnie & James Baker, Nettie (Burke) & Claude Baker, Paul & Virginia (Wolliver) Baker. 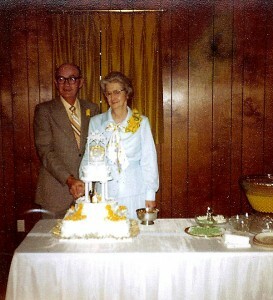 Grandpa & Grandma Baker @1978. 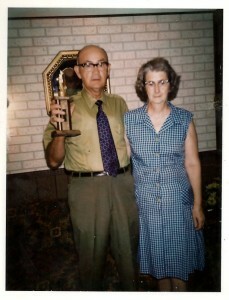 Grandpa had recently won a fishing trophy and was very proud of it. 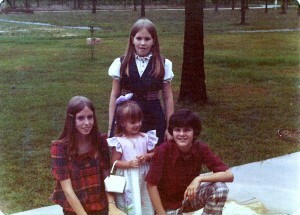 (left) Sandra Gay, (back) Donna Gay, (right) Tim Baker. I’m not sure who the little girl in the middle is. 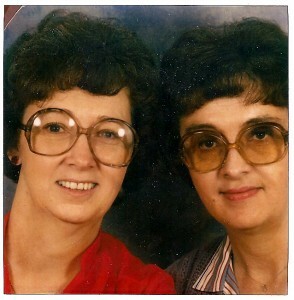 My mom, Evelyn (Baker) Roberts, and my aunt, Shirley (Baker) Gay. They have been told many times that they look like twins. Grandpa Baker with his kids. 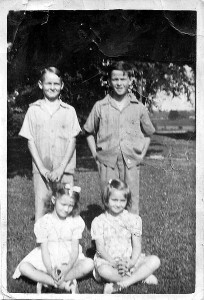 (l-r) Shirley (Baker) Gay, Evelyn (Baker) Roberts, Claude Baker, Paul Baker, David Baker. 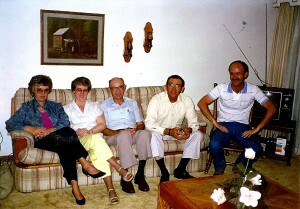 The Baker clan at our house in Kettering, Ohio, in 1981. 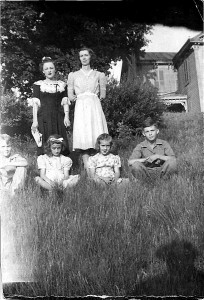 (l-r) Rhonda (Pittman) Baker, Jodie Baker, David Baker, Nettie (Burke) Baker, Evelyn (Baker) Roberts, Claude Baker, Gwen Roberts, Dan Gay, Shirley (Baker) Gay, Donna Gay. 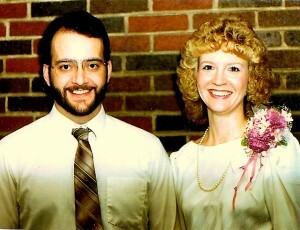 Rick & Debra (Baker) Connor at their wedding in 1985. Debra is the oldest daughter of James & Monnie Baker. The Gay clan, 1988. 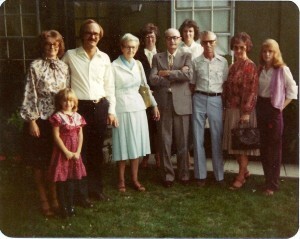 (Back, l-r) Ben , Sandra (Gay) , Donna (Gay) , Andy , (Front, l-r) Christa , Dan Gay, Shirley (Baker) Gay, Daniel . 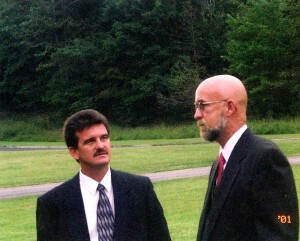 My cousin, Tim Baker, & my uncle, David Baker, 2001. Tim is Paul Baker’s youngest son. 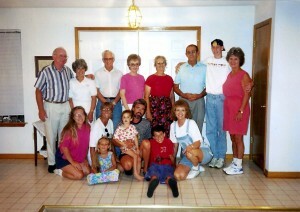 The Baker clan at Tim & Sally Baker’s house in Milton, Florida, 1994. 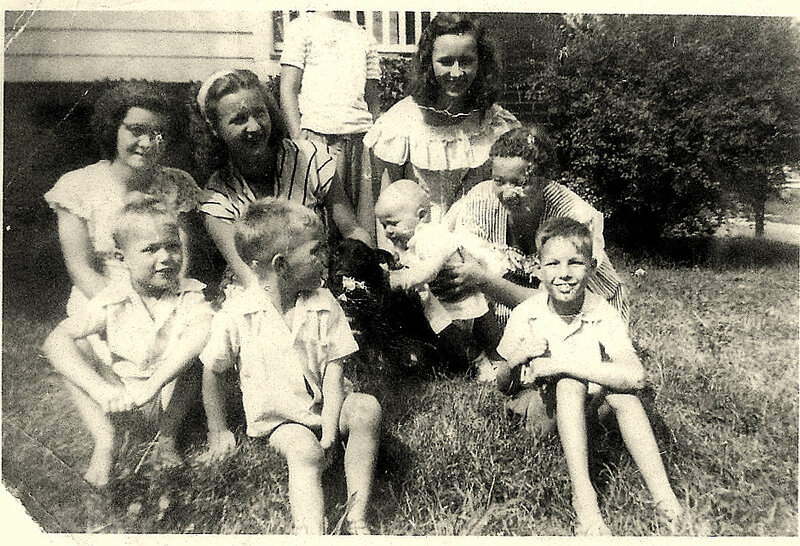 (Back, l-r) Sally’s mom & dad, Dan Gay, Shirley (Baker) Gay, Virginia (Wolliver) Baker, Paul Baker, Jeremy Kouba, Monnie Baker, (Front, l-r) Sally Baker, Linda (Baker) Blevins, Baker, Blevins, Randy Blevins, Blevins, Debra (Baker) Connor. Hey, who posted this – was it you, Jeff Roberts?!? A FB friend of mine found this link, sent it to me, & I didn’t even know it existed!! And, what ever happend to Uncle David Baker’s book he was writing?! Anyone know? I have bits & pieces of it in my Baker Genealogy file. Did anyone ever get it published … or at least part of it? This is SO COOL! And, BTW, my last name is spelled wrong. HA! It is spelled: C-O-N-N-E-R. HA, again! And, while U R making corrections, would you care to give my (favorite/only) son’s full/given name, please? It is: Jeremiah Wade Kouba. I’m so glad to have been provided with this link. I was going 2 pick up Dave’s file that I’ve tucked away … SOON! Had been meaning to before now, but guess what … LIFE gets in the way! Hope this site helps the Baker FAMILIES reconnect. 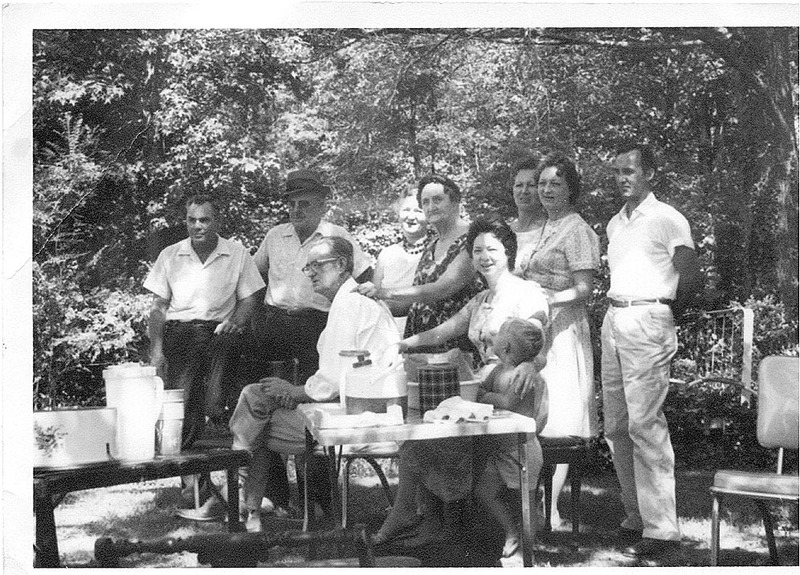 Remember the Baker Reunions at Uncle Joe’s & Aunt Sophia’s farm/home in Kyles Ford?! They were AwEsOmE! Loved seeing your pictures. 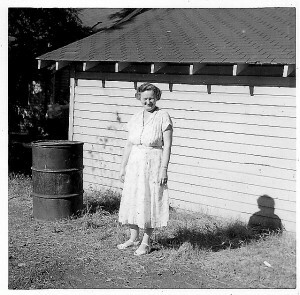 My grandmother’s great grandmother was Delilah Baker. Delilah was born in 19 February 1848 in Charlestown Township Clark County Indiana. Her parents were Roland Baker and Elizabeth Pittman. They were married the 15 January 1828 in Indiana. They eventually ended up in Missouri. Roland Baker was born 5 February 1809 but I don’t know where or who his parents were. 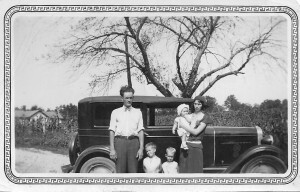 Roland and Elizabeth married in Indiana. William, I live in Spartanburg, too. 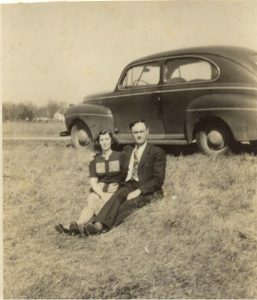 There was a Baker family who moved from Kyles Ford to Spartanburg in the late 1940’s. The entire family came and they all worked at Spartan Mills. We were their next door neighbors. They were all good, decent, honorable people with a work ethic not seen anymore. 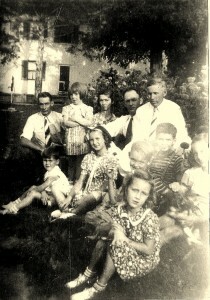 Their father was Andy J. Baker and their mother was Lillie Sizemore Baker. I believed the mother died before they came here. 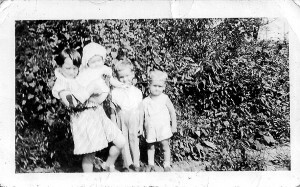 There were at least four brothers and four sisters who came with their dad. Some of the names are:Irene, Bee, Quinne, Otis, Buck, Foster, and a couple others. I may be interested in visiting the Baker Family Cemetery in Kyles Ford at some point. 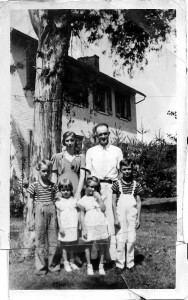 Would love to hear from you and find out if you knew this family. Take Care. I so enjoyed all the family pictures. 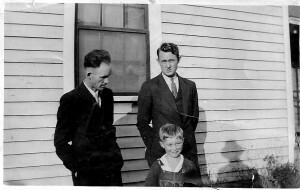 My Father was Claude Baker, and my Mother was Nettie Mae Burke, Baker. We had a wonderful family on both sides. We had a lot of good times together. Thank You for putting all of this together. I will look at it many times and remember all the good times, we had together. 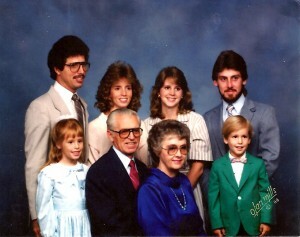 We had a wonderful family. 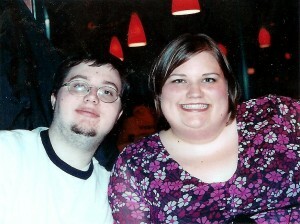 Looking for info on David Baker/Rhonda Pittman. ANYTHING WOULD BE APPRECIATED. Hi Patsy. I passed your email address on to Rhonda. 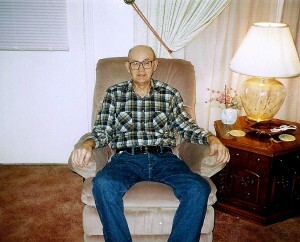 Sadly, uncle David passed away in 2004 from pancreatic cancer. He was like a big brother to me and we all miss him greatly.